Conrad wrote some great books, but this isn’t one of them - the big plus point being that you only have to read 150 pages before he runs out of steam. 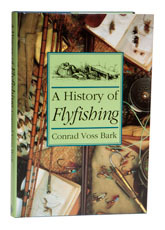 To be sure, A History of Flyfishing is reasonably accurate, but to put it politely, Conrad has some off-beat ideas about how things happened, there are big gaps and whenever he gets a chance to toe the party line he does so. The consequence is that this book represents little advance over John Waller Hills' history which was written half a decade previously, yet somehow manages simultaneously to be more readable and more informative. This is the book that made me write The Fly, because before I got started on the manuscript even I could spot the places where Conrad had got himself into a muddle.